The sound of the ball on the crossbar may as well have been a sniper’s bullet. 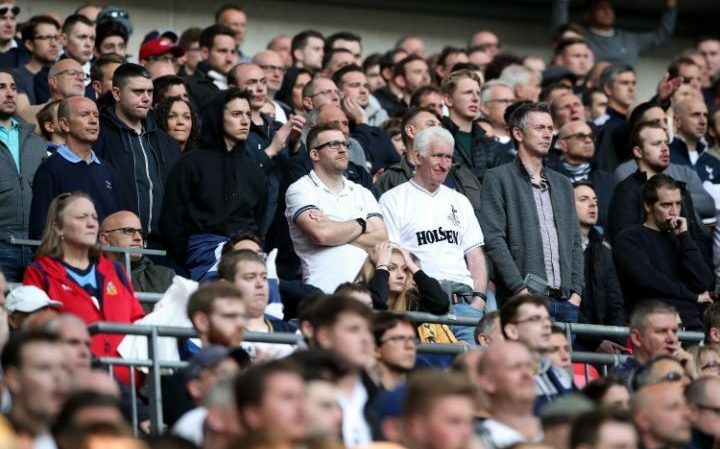 Tottenham fans look dejected against Chelsea at Wembley the split second it took for Nemanja Matic’s shot to ripple the net, Tottenham’s players were collapsing to the Wembley turf as one. Chelsea were 4-2 up. The dream was over. Like barbed wire to keep out our despair. Hope must be a minefield. This is what being a Tottenham fan for the last quarter of a century must feel like. Hope is going into a Premier League campaign with the sixth biggest wage bill and still fancying you might win it. Hope is turning up at Wembley for an FA Cup semi-final full of optimism, even though the man who scored the last time you won one is now 56 years old, greying and presenting the BBC’s television coverage. Hope is ripping off the plaster and daring yourself not to see the scar underneath. From early afternoon, the battle cry of hope had poured out of the train doors at Wembley Park station and carried all the way into the stadium. All along Wembley Way, Tottenham’s fans tried to bury Chelsea’s in song. But as they filed despondently out of the stadium several hours later, you suspect that they had also been trying to drown out their own paralysing fear: to exorcise the demons that have haunted them ever since Gary Mabbutt lifted the FA Cup in 1991. The road to Tottenham’s first major trophy since 1991 is paved with rotten memories. Tony Adams, 1993. Daniel Amokachi, 1995. Alan Shearer, 1999. Robert Pires, 2001. Kevin-Prince Boateng, 2010. Juan Mata, 2012. They retain fond memories of their two League Cup triumphs in 1999 and 2008, yet this, in its own way, is somehow indicative. Big clubs do not remember their League Cup victories. To this catalogue of pain we can now add Willian and Eden Hazard, 2017. A semi-final billed as the harbinger of change offered simply more of the same. And this scar is one that will fester. 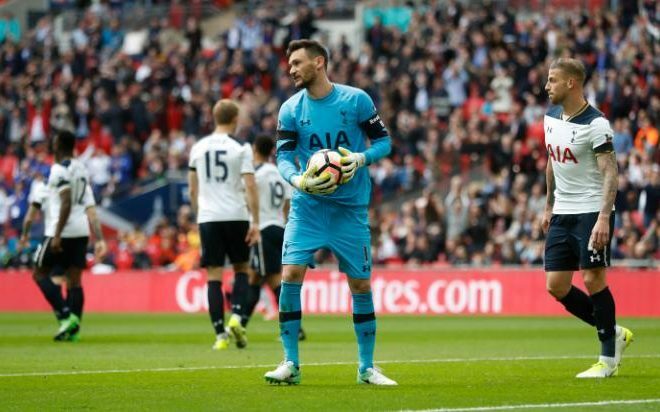 Until 5.20pm on Saturday evening, the point at which Willian’s free-kick hit the back of Hugo Lloris’s net, Tottenham certainly had plenty to shout about. They remain the coming force in English football. They are perhaps the most exciting team in the country right now. But they have still won nothing. The Premier League title is still within reach, but for now hope remains their minefield, their prison. Mauricio Pochettino does not do hope. Pochettino has given up too many freezing mornings and sleepless nights to put his fate in the hands of hope. What he deals in, more accurately, is dreams. Last season, Tottenham’s title dream died in collective meltdown at Stamford Bridge, during a 2-2 draw that saw them become the first team in Premier League history to pick up nine bookings in a single game. Cooler, calmer, more clinical: this is the new Tottenham Pochettino is trying to build. And yet, the tragic events of this week must surely have affected them. How do you keep your heads when a member of your family has been ripped away in his prime? How do you play without emotion in the face of such loss? “When this type of situation happens, football is not important,” Antonio Conte observed ahead of this game. But Conte was wrong. In the face of human tragedy, the solace and solidarity of football is more important than ever before. One man falls; the rest of us stagger on as best we can. And this was a Tottenham performance that for whatever reason always seemed on the cusp of bubbling over. If it was not a flying elbow or a cheeky stamp, it was a misplaced pass or a hasty clearance. 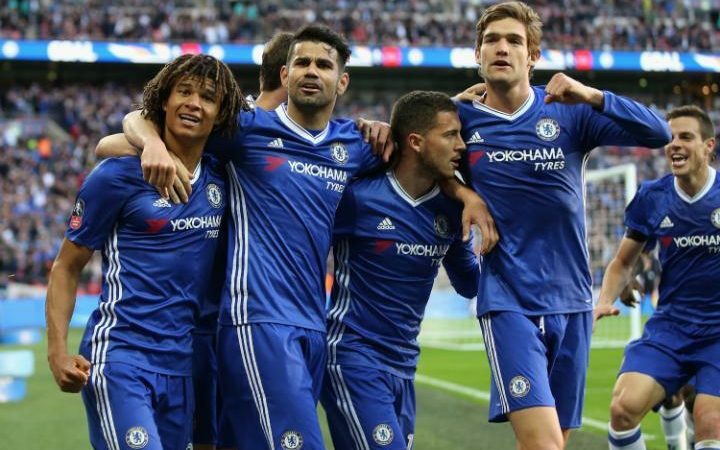 Despite withstanding sustained pressure, Chelsea kept their heads, and triumphed. This much was evident from the opening minutes: Toby Alderweireld’s desperate challenge on Pedro, Hugo Lloris’s premature step to the right, Willian’s free-kick sailing to his left. For a few minutes after going behind, Tottenham were all over the place. Every long ball felt like a cannonball. Eventually, they collected their thoughts and regrouped. Harry Kane glanced in an equaliser. But every time Tottenham seemed to have mastered their emotions, a fresh brain fade would assail them. On the stroke of half-time, Son Heung-Min scythed down Victor Moses to give away a penalty. At 2-2, three Tottenham players got in each other’s way at the near post, and Eden Hazard smashed home Chelsea’s third goal. Matic’s fourth was the final insult. And in the coming days and weeks, Tottenham will need to examine how and why their composure deserted them when it was needed most. How a game that they dominated for long periods ended in a thumping. The basis of their optimism remains undimmed. The four-point gap in the Premier League table has not expanded. They will continue to hope. But for now it is a plain hope, without dreams.